A Jaguar D-Type and one-off Ferrari 275 GTB Speciale custom built for Battista Pininfarina will headline the 2018 Gooding & Company Scottsdale sale, scheduled for January 19-20 during Arizona Auction Week. “What could be better than one of the most original D-Type Jaguars and a one-off 275 GTB Ferrari with countless special features built for Battista Pininfarina? Both possess everything that the most discerning collectors value – spectacular design, impeccable provenance, and rarity,” said David Gooding, President and Founder of Gooding & Company. The Jaguar D-Type took the racing world by storm when it debuted, delivering three consecutive overall wins at the 24 Hours of Le Mans (1955, 1956, and 1957). Jaguar developed the car as a replacement for its C-Type under the direction of company founder William Lyons and chief engineer William Heynes. Utilizing the latest advances in aircraft and automotive technology, the D-Type featured a high-strength alloy monocoque chassis with steel subframes and a state-of-the-art aerodynamic body made from lightweight aluminum. Sensing tremendous demand from its clientele, Jaguar built 67 customer D-Types for privateers to campaign. The 1956 Jaguar D-Type featured at Gooding’s 2018 Arizona auction, chassis XKD 518, is one of two D-Types delivered in a red livery. The first private owner was British racing driver Peter Blond, who purchased the car from Bernie Ecclestone. Blond raced XKD 518 until 1957, with highlights including a 5th overall at the Aintree 100, a top 10 finish in the Goodwood Trophy, and a win at the Snetterton National Race. After Blond sold the Jaguar in 1957, XKD 518 had several owners including famed racer Ms. Jean Bloxham and Led Zeppelin band manager Peter Grant. Presented in its original livery with its matching-numbers engine, XKD 518 is estimated to sell for $10,000,000 – $12,000,000. The 1965 Ferrari 275 GTB Speciale presented at the 2018 Gooding & Company Scottsdale auction, chassis 06437, is the only 275 GTB designed and built by the house of Carrozzeria Pininfarina, rather than by Scaglietti. The Ferrari was built for special display and show purposes, as well as for Mr. Battista Pininfarina’s personal use. Though it shares a similar shape to the original short-nose 275 GTB, the myriad bespoke details inside and out make 06437 unique. Some of these major details include a completely one-off interior treatment with special seats, electric windows, and Heuer Rally-Master stopwatches. Exterior details include more prominent front indicators, recessed side marker lights, a special grille, unique headlamp covers with no chrome surround, custom-built window frames, even sleeker door handles, and a distinctly revised hood to fit the six-carb intake setup on the V-12 engine. One of the most memorable features of 06437 is its distinctive rear diffuser, which features three curved panels placed vertically below the bumper, filling the area between the exhaust tips. Battista Pininfarina also specified that there be no driver’s-side vent window — a feature he disliked, as he believed it distracted from the purity of the design. When new, the 275 GTB Speciale was finished in Acqua Verde Metallizzato, a blue-green color selected from the Alfa Romeo catalogue, and trimmed in China Red leather upholstery. Battista Pininfarina was so proud of his personalized 275 GTB that he unveiled it at the company’s winter press conference in Switzerland. This was followed by appearances on the Pininfarina display stand at the 1965 Frankfurt Motor Show, the 1965 Paris Motor Show, the 1965 Torino Motor Show, the 1965 Florence Concours d’Elegance, and the 1966 Brussels Motor Show. The car was restored to its original appearance in 1992. The Ferrari was then sold to its current owner, who has largely kept this car out of the public eye for over 25 years. 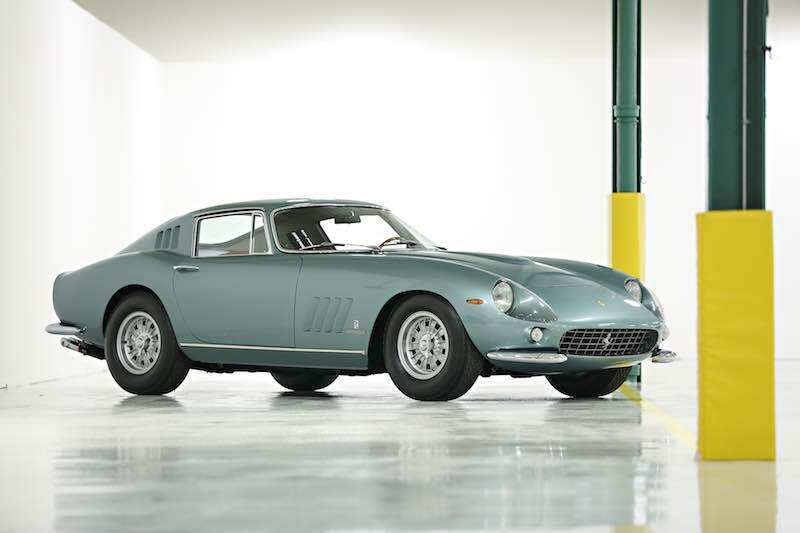 This 275 GTB Speciale is estimated to sell for $8,000,000 – $10,000,000. In addition to the Pininfarina 275 GTB, Gooding will also offer a 1958 Ferrari 250 GT Series I Cabriolet, 1954 Ferrari 500 Mondial Series I, 1954 Ferrari 250 Europa GT and 1961 Ferrari 250 GT Series II Cabriolet. 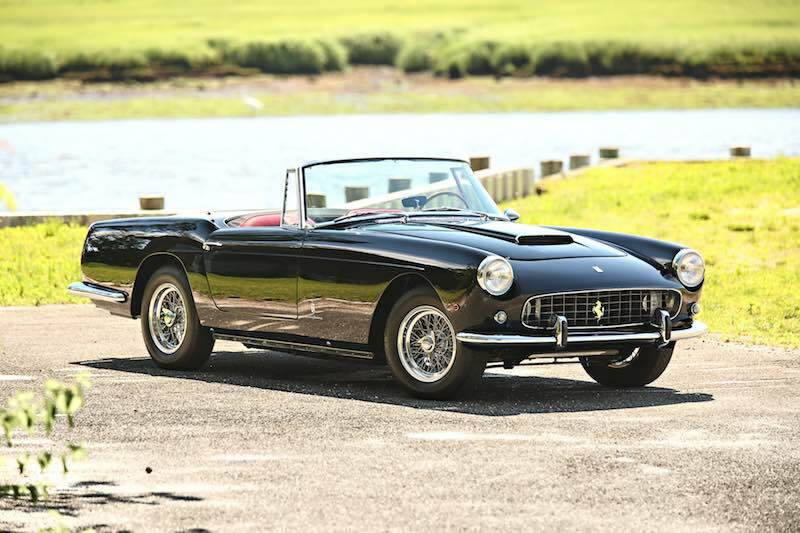 Between 1956 and 1959, Carrozzeria Pinin Farina produced a series of 41 Cabriolets on Ferrari’s 250 GT chassis. The 1958 Ferrari 250 GT Series I Cabriolet here, chassis 1079 GT, was displayed on Ferrari’s stand at the 1958 Torino Motor Show, and was pictured in that year’s official Ferrari Yearbook. Originally sold to the prince of Saudi Arabia, the Series I Cabriolet would go on to be owned by collector John Clinard for more than 40 years. During his ownership, he displayed the car at numerous events, including the Pebble Beach Concours in 1993 and 2004. Today, 1079 GT has been returned to its original livery of Grigio Conchiglia with red leather upholstery. This coachbuilt 250 GT has been certified by the Ferrari Classiche department, and its history has been documented by Ferrari authority Marcel Massini (Estimate: $7,000,000 – $8,500,000). The 500 Mondial was the first Ferrari four-cylinder sports racer that utilized the two-liter Lampredi-designed engine developed from the World Championship-winning 500 F2. 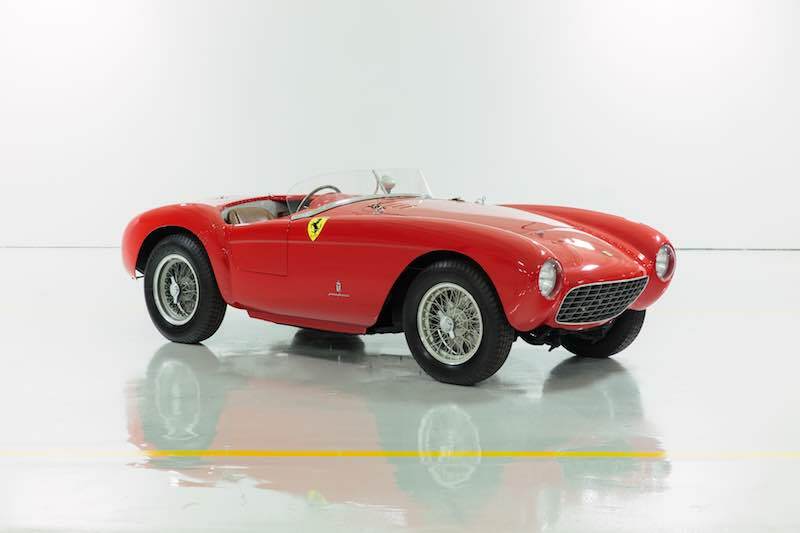 This Pinin Farina-bodied 1954 Ferrari 500 Mondial Series I Spider, chassis 0434 MD, was sold new to race car driver Herman Roosdorp through famed dealer Garage Francorchamps. Roosdorp and second owner Hans Maasland campaigned the car at numerous races between 1954 and 1956. The 500 Mondial has since been owned by many collectors and has been displayed at the Pebble Beach Concours and participated in the Mille Miglia Retrospective. Retaining its original engine, 0434 MD is estimated to sell for $5,000,000 – $5,750,000. 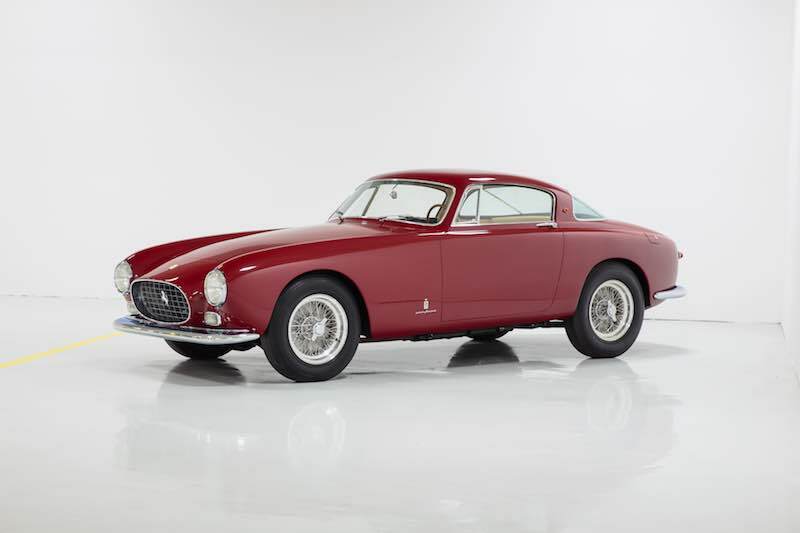 Introduced in 1954, the Ferrari 250 Europa GT featured Pinin Farina coachwork and a three-liter V-12 engine developed by Gioacchino Colombo. The 1954 Ferrari 250 Europa GT offered in Arizona, chassis 0379 GT, is unique among the series for its distinctive rectangular driving lights, decorative chrome trim, and unique interior appointments. This car debuted on the Pinin Farina stand at the 1955 Torino Motor Show and was sold new to a cinematographer in Rome. Today, the car is presented in the color combination of a deep red over a tan leather interior. A fixture in a major collection for the past two decades, this Europa GT is being offered at auction for the first time in its history (Estimate: $1,600,000 – $2,000,000). The 250 GT Series II Cabriolet was the final evolution of open-top models in Ferrari’s 250 line. It benefitedfrom technical advancements that added to its overall driving experience, such as disc brakes and the latest iteration of the Gioacchino Colombo-designed three-liter V-12. 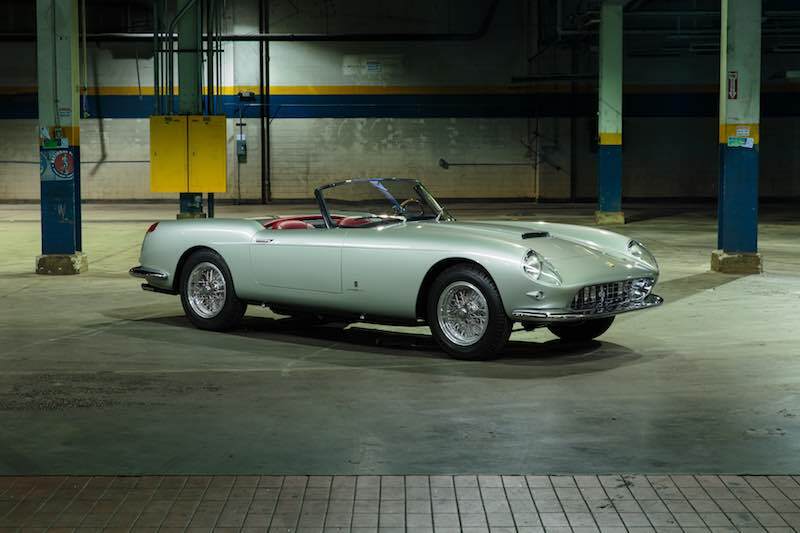 The offered 1961 Ferrari 250 GT Series II Cabriolet, chassis 2341 GT, was sold new to its first owner, American film and television actor Gordon Scott, perhaps best known for his work as the lead in several Tarzan films. The car was restored in 2010 and refinished in the color combination of black over a red leather interior. It is complemented by a canvas soft top and detachable hardtop (Estimate: $1,500,000 – $1,800,000). For further information, visit GoodingCo.com.